On February 03, 2015, FuseNet awarded the European Fusion Master’s and Doctorate certificates. Thirteen students proudly received their certificate in a ceremony at Culham Centre for Fusion Energy in the UK. The certificates are a recognition of excellence in fusion science and technology, and can be awarded to European MSc and PhD students who fulfil academic criteria that have been jointly established by universities and fusion research centres throughout Europe. 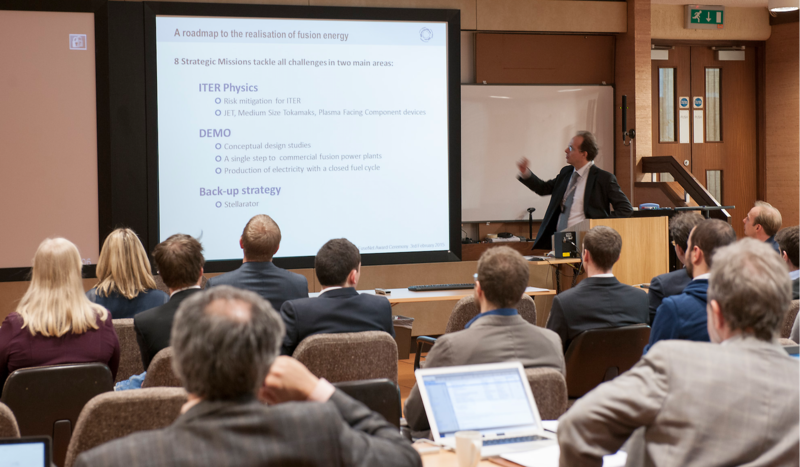 This award ceremony was organised by FuseNet with financial support by EUROfusion - the European consortium for the development of Fusion Energy. The festive day started off for with a tour of the JET facility. Because the facility has entered a maintenance period, the students got the opportunity to get inside the torus hall to see the world’s largest tokamak up close and ask any question. 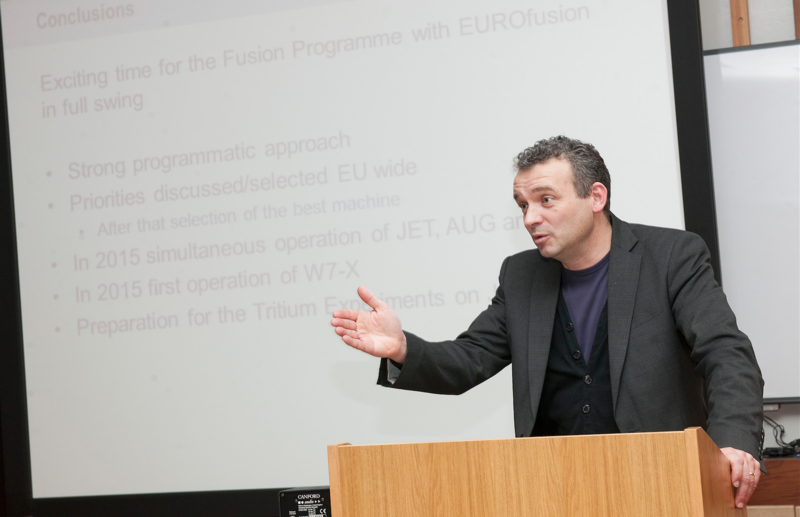 Next, on behalf of EUROfusion, Dr. Duarte Duarte Borba welcomed the students and gave a detailed overview of the JET programme and its supporting role to ITER. After this talk, the students were personally addressed by the newly elected chairman of FuseNet Dr. Roger Jaspers. "To get from an experimental reactor to a DEMO reactor, we need you!" said Dr. Jaspers, directly looking at the thirteen ambitious young fusion graduates. "We need the best people to pull on the same string to overcome the challenges ahead, because fusion is so incredibly difficult". Newly elected FuseNet chair Roger Jaspers addresses the FuseNet students during the award ceremony. Then the word was given to the Chair of the Academic Council, prof. Ambrogio Fasoli, before proceeding to the actual hand-out of the certificates. Professor Fasoli congratulated the students on their achievements, emphasizing the fact that the FuseNet certificate testifies not only a proficiency in a specific topic related to fusion, but it also testifies that one has been exposed to the multidiscipinarity that characterises fusion, and has started to develop an overall vision of the field. Such overall vision, and the examplary commitment of the fusion researchers - sometimes at levels that deserve the denomination of them as fusion heroes - are aspects that will inspire the graduates in their career in fusion, or outside fusion, should they leave the field, and become ambassadors of our field. 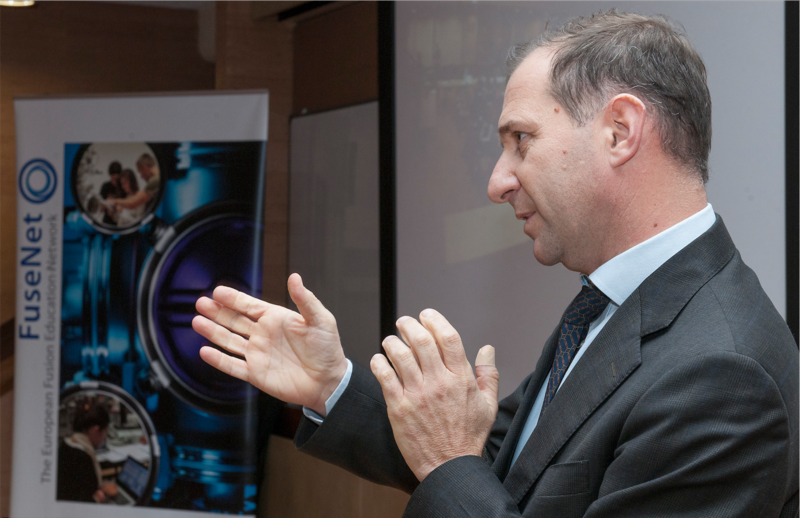 The Chair of the Academic Council concluded (with his tongue in the cheek) by expressing a personal envy with respect to the new generation of graduates: they will be able to witness Q=10 in ITER, see DEMO developments and most importantly, they will be in a position to invest in fusion related stocks and make money on them. With this free advice and the best wishes for their future career, the students then received their Fusion Master’s and Doctorate certificates one by one, out of the hands of chair of the Academic Council of FuseNet. In total 16 students received their certificate this round, of which 13 could be present live. Students that are about to complete they Master’s or Doctorate in fusion, can continuously apply for a European Fusion Master or Doctorate Certificate through the FuseNet website (www.fusenet.eu/certificates). Applications will be evaluated twice per year. The academic criteria for the award of the certificate were developed by a broad academic committee under coordination of FuseNet, with support from the European Commission.